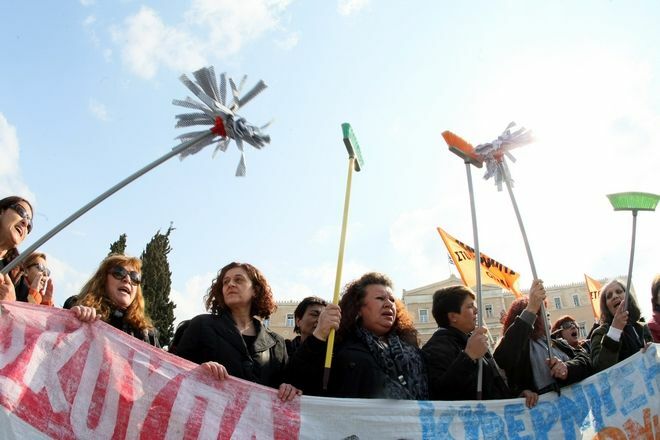 After 11 months of bitter struggle, 595 public sector cleaners, all women, have become the embodiment and the soul of the most ferocious resistance against the politics of austerity in Greece, having dared to confront the power of the Greek government, the European Central Bank, the European Commission and the IMF ( the last three known as ‘the Troika’). 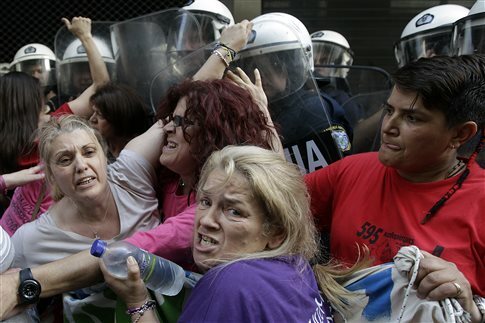 Most recently the women have occupied and blocked the entrance of the Ministry of Finance in Athens and they chase the officials of the Troika when they want to enter the Ministry, forcing them to flee and use the back service door with their bodyguards. 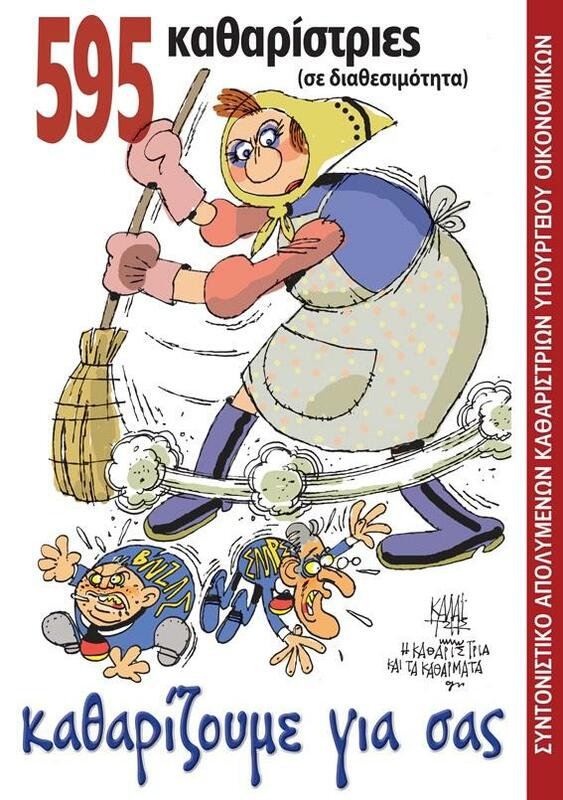 Support the International Day of Solidarity by joining the Greece Solidarity Campaign (with your buckets, mops and banners) when we Stand in Solidarity with the 595 Cleaners – 09.30 to 11.00 hours – Saturday 20 September – outside the Hellenic Centre, 16 Paddington Street, Marylebone, London W1U 5AS. The women cleaner’s fight began when the Greek government moved to implement the harshest part of the austerity programme and comply with the terms imposed by the Troika “lenders” and targeted as first priority the women cleaners at the Ministry of Finance, Inland Revenue and Customs offices. In August 2013 it moved them into “the reserve pool” (meaning that for 8 months they would be paid only 75 % of their monthly salary of 550 Euros and then be sacked). The government objective was to attack first the weakest and those with the least chance of getting support, ie the women cleaners, and then follow it up by attacking the bulk of the employees, making 25,000 civil servants redundant. The government aims to privatise the work of the women cleaners – passing the work to companies who would re-employ the women at 200 Euros a month (ie 2 Euros an hour), with partial insurance, no employment rights – conditions akin to semi- slavery. The women decided not to give in and have self organised and developed imaginative forms of direct collective action to catch the attention of the media and to resist and reverse the measures imposed on them. They use non-violence, humour and spectacle. They stood at Easter before the Ministry of Finance wearing crowns of thorns on their heads, they wore nooses around their necks outside the government party offices of New Democracy. And, with music and with dance, they are demanding the immediate reinstatement of each and everyone! Read a full commentary in our Comment section here. Visit the women’s website -see the photos and music videos of their battle – leave a message on the International Solidarity page.